← Podcast Episode 78 – That was fast! In mainland China Youtube is blocked. Some people and schools pay for VPNs to have a slow and throttled Youtube experience. I suppose if core curriculum content is coming from a third-party source that is being hosted on Youtube, there are not many options – VPN is the only solution. That being said, since I have been here I have found many content creators like Khan Academy have legal methods for schools to download and serve their content on private servers. It takes time to confirm that it is legal to download and re-distribute, but those developing for education usually do not mind. The other reason people need Youtube, or think they need Youtube, to host their own videos is because they found some shortcuts in their software that resulted in subtle brainwashing. Here is an example of this clever menu design in the Quicktime image below. I firmly believe when users see built-in options like this, they shutdown, stop thinking, and simply start clicking. Since the rise of services like Youtube people have lost the skills to maintain their own media. And for those out there who are sick of Ads and other annoyances with services like Youtube, it is time to consider doing something that people have been able to do since the 1990’s- serve your own media. Not only can you do it, but you can do it better and faster than you can with most of the popular services. That voice forming in your head that would like to argue with me is saying, “Wait! What about storage, we can’t afford to store all our videos.” Really? Are you sure? How much video do you have..have you really added it up? Did you inventory your video the correct way? Before I was in education, I was in video production. The real stuff. TV, documentaries, etc. I was putting video online when most people reading this were learning how to spell I-N-T-E-R-N-E-T. I know a thing or two about managing a large digital library that has to be used to create original content. Think about it, videos indexed by scenes, so you can find a 10 second segment you need for a large piece to be used in a political smear campaign. It seems time consuming because it is. It is hard work, and forces organization. Instructional content and entertainment you own and have created. Instructional content and entertainment content you have purchased from a third-party. Student created content, public and private. The next step is to make a decision as to how long you will keep media from categories 1-3. I would say every year the student content needs to be purged, except for some very excellent exemplars. Students can keep their own copies. Instructional materials owned by the school should be kept for 2-3 years, but then, it needs to be updated and even deleted. Keeping those parameters in mind, how much storage will you need? Remember you will be serving either FLV files or some form of MP4. 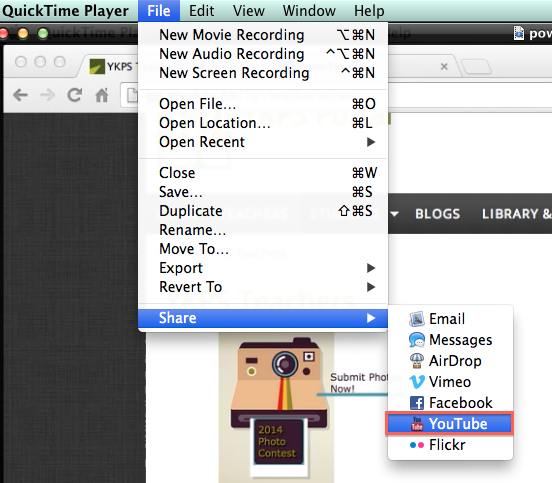 Not only can you create these easily on Mac and Windows, you can BATCH convert them with programs like Mpeg Streamclip. You can take the files created in programs like iMovie, and make them 60% smaller without hurting the quality. Add-up the total amount of data you are using on Youtube, reduce the size by 30% to be conservative, and now ask yourself can you afford to host your own videos. Most hosting plans have huge amounts of storage, but might limit you on your monthly bandwidth. Most allow you to add additional bandwidth if you need it. Having 2-3 accounts on the same hosting service, is an easy way to off-set bandwidth limitations for very little money. Five gigabytes of monthly bandwidth is about 15 hours of standard definition movies. If you figure the average instructional video is 5-10 minutes long, that means 90 instructional videos @ 10 minutes at standard definition Netflix style playback. Most of the videos you can easily compress will be significantly less than that. If one hosting account was 100 USD a year, you would be able to serve over 900 videos based-on the limitations above, even though the number would probably be closer to 1200-1500. Add two additional accounts, for a total of 300 USD a year, and you can serve 2700 videos a year or 270 videos per month. (I am not counting the summer/holidays in the estimate). I am using a cheap account for this math as well, there are others designed for media hosting that are cheaper for larger amounts of monthly bandwidth. Many schools have their own internal hosting, and probably have what it takes to serve Youtube quality video without any additional cost. Schools paying for a VPN to host their own content on Youtube are losing money, because VPNs are expensive and the performance is horrible. Most schools pay for some kind of hosting anyway, so the expenses listed above are most likely already in the operational budget. Schools that can use Youtube for free are losing valuable time and control over the user experience. The reason schools lose time, is because uploading you own videos using FTP is significantly faster than doing uploading using the built in services in software, or the web-based uploaders. Ask yourself, how many times have you sat and let your computer work to convert and upload a video? It can take 30 minutes or it can take hours. The failure rate for uploading without FTP is also significantly higher. Time is a currency in education, and wasting it, should be avoided. Even students can get videos off iPads and laptops onto a private server faster than using the student Wifi to sync 30 videos within a class period. Time wasted on uploading, is time wasted on learning. Finally, when free services are used, control of intellectual property is lost. Rules for usage and ads can be changed with little or no notice. Exposure to content can only be assured on paper, not really guaranteed. Privately hosted content can be fully controlled, and delivered in many creative ways. That other type of media content I mentioned, Instructional content and entertainment content you have purchased from a third-party, that can be managed in some very interesting ways as well. It is amazing what one can do with a complete understanding of protocols that make podcasting work. However, that is more of a private conversation. Do the math, and have the conversations. Learning to really manage media is a great educational process for teachers, IT administrators, and students. In the end, the learning happens within the process, so it worth beta testing and exploring. This entry was posted in Educational Technology and tagged Hosting, video, YouTube. Bookmark the permalink. I think in an environment where youtube is degraded, your post is 100% spot-on. But in places where youtube works, it is a best-of-class tool. Many of our teachers would be lost without it. I like your ideas about how videos should be organized in schools, and we have an internal fileserver for managing student-made videos. As we increase flipping instruction, we find youtube to be invaluable resource. I just think at some point, not too far from now, we are all going to need to get our content out of Youtube. I have had to do that once actually, it was a nightmare. I like iTunes – U alot, even though it requires iTunes. It is private and allows local file storage in iTunes. Tony – you also have to consider the workflow needed to support this at a school. That person (or people) who manage the storage become gatekeepers and depending on their efficiency teachers may have to wait a day or two to get their content hosted. This can cause problems. Think of it like a centralized person who does copying at a school. It’s never as convenient as it would be if the teacher could just do it themselves and YouTube accepts just about any video which makes it even easier for those who do not have any knowledge of different formats or Codecs. Anyway. It is EASIER than Youtube. Serious. I said FTP- but I mislead you. It is the FTP PROTOCOL which is faster than the normal uploaded you use on Youtube. You access it with a login on a webpage and literally DRAG and DROP. Both my system- Zenphoto + Flowplayer, and other PHP streaming systems work the same. @Your School I know you are using a different way to add media, that is only because the media would be highly illegal if not closely monitored. But if you create a user on the system you have and give them power to create and modify albums you will see how easy it is. BUT…also…You can still use an FTP client. That means as the IT manager or media manager or librarian, you could do a massive bulk upload to the site. These are things you cannot do with Youtube. There is no scale and no ability it grow faster than Youtube will allow you to grow. Consider Youtube video length limits, how crazy is it that I cannot easily buy what I need from Youtube? I have to be an approved partner to add a 2 hour video. With my concept- you video length is up to your needs. Anyway that is all I have. Being removed from all these services has actually made me better at what I do. But I am also again most modern OS development and selfies.